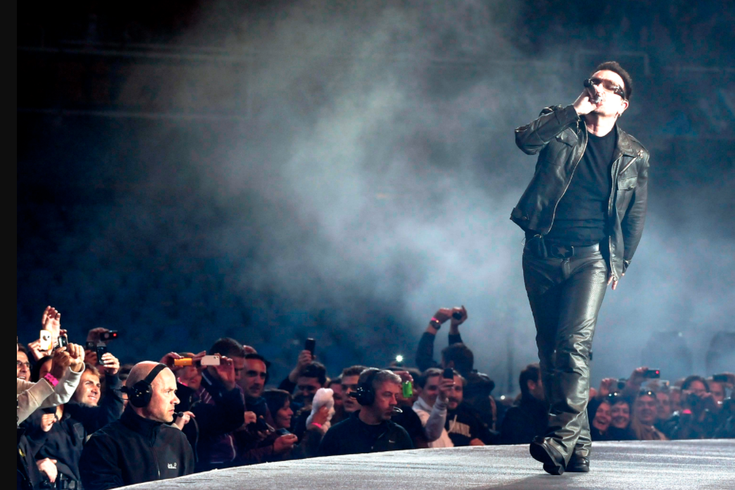 Did you know that Bono is also the godfather of Brad Pitt and Angelina Jolie’s twins? U2 plays the Linc on Sunday. Corralling a new generation of New Orleans jazz legends, Trombone Shorty isn’t a purist, but he is carrying on tradition. Like many of the great horn players from the city before him, Shorty’s jazz splays out into R&B, funk, blues, and rock without ever feeling like a reach. On his latest, the New Orleans bandleader is digging further into tradition while also pushing it forward: for his debut on the iconic Blue Note label, Shorty is trafficking in what he’s dubbed “Parking Lot Symphony.” The music inside delivers on the title’s promise, in which the type of interfering noise you might expect out of a passing car becomes the soundtrack to the main stage. You might not immediately recognize the names Jon Herington or Jim Beard – the latter a Philly native, but both the guitarist and keyboardist have played sounds you’ve heard before. Together they make up a core element of Steely Dan’s latter day rhythm section, and they’ve clocked plenty of disparate work as session musicians and soloists. Virtuosic and perpetually busy, they join forces at Kennett Flash this weekend for a one-off duo performance. If you try to describe the band to a friend who’s never heard of them, Sigur Ros sounds downright out there. The Icelandic band trades in heavy, droning post-rock, and so their songs seem to crawl before they explode. The sounds they conjure are weird and mystical and patience is a strict prerequisite. In that way, listening to a Sigur Ros record is like taking a long road trip in which the drive itself is half the fun: you buckle in and hunker down knowing that the destination is far off, but the moments in between seem like the real payoff anyway. A rising force on the Philly punk scene, Sheer Mag’s brand of soulfully rollicking rock has caught on quickly. Their songs—often short, fast, and loud—are built out of in-your-face guitar riffs and unapologetic vocal catchiness. After bundling up their early indie singles into an impressive compilation LP, the outfit shares their long-awaited debut album next month. But before that, they’ll play a free show for in-the-know locals as a part of XPN’s relentless Free at Noon series. Doubling down on its commitment to a uniquely diverse artist lineup, this year’s Firefly Music Festival boasts a particularly eclectic showcase on Saturday. While The Weeknd and Chance The Rapper might be festival favorites by now, Firefly bridges generations with the inclusion of Bob Dylan as a fellow headliner. Let your eyes wander further down the performer list and you’ll find plenty more head scratching juxtapositions. Swedish EDM duo? Check. Industry embattled starlet? Check. The upshot is obvious: there’s a little something for everyone. Few genres are so time-bound as alt-metal, that marginal mainstream offshoot that might seem like its day is long past to outside ears. You might not hear a Deftones track on the radio anymore, but after a four-year hiatus, the Sacramento legends returned last year with a record that launched up the sales charts nonetheless. Having long cultivated loyal fan bases, it’s a bit endearing to see the group join forces with a like-minded crew of fellow pop metal outcasts like Rise Against and Thrice. Even if a younger generation might forever associate U2 as that old band that forced their music onto our phones a few years back, it seems like a given that they’ll remain forever ubiquitous. Did you see that picture of Bono and George “Dubya” hanging out recently? Did you know the iconic lead singer is also the godfather of Brad Pitt and Angelina Jolie’s twins? But on the occasion of the 30th anniversary of “Joshua Tree,” the Irish outfit’s 1987 opus, U2 is back to doing what they do best: packing stadiums. In fact, U2 might be better than any other band not just at packing stadiums, but pleasing the crowds that file into them. Plus, a bunch of us probably still have that pesky album stuck in our iTunes libraries.